Just as you were getting used to Facebook, Twitter and Foursquare, the social media family just got a new addition: Color. This new photo sharing app differs from the rest with its ability to deliver location-based photos and videos from people in your proximity. 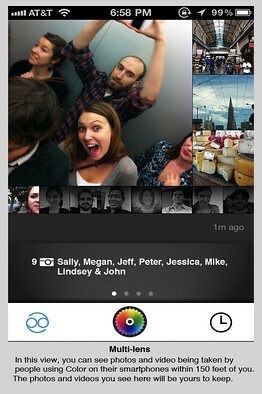 With Color all your pictures are instantly shared with the rest of the world including the place and time. Some experts have expressed concern over privacy issues given the fact that the Color social network is completely open to the public. Are privacy concerns legitimate in the age of social networking? Read on to find out more. Only a week after Color came out for both Android and iOS, social media pundits were quick to point out the possible flaws and dangers related to the app. Although Color is only meant to display photos and videos from your immediate surroundings based on your geographic location, users have been able to easily generate fake locations to spy on people anywhere in the world. Some people fear this may lead to people using Color for dubious purposes. The people behind Color never tried to hide the fact that it violates people's privacy. In fact, that's the whole point of using this new social media tool! Since everything is completely public and transparent on Color as it is, what's the point in fretting over the fake location hack? Call me jaded, but privacy has been long lost in the social media explosion and there's no turning back. As far as the app itself is concerned, I think it's a pretty cool concept, but we'll have to wait and see how popular it's going to get in the coming months. I wouldn't use such an app. Imagine you were taking nu... nevermind.